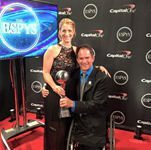 A chat with Krige Schabort, the Winner of the 2015 Espy Award for the Best Male Athlete with a Disability; Paralympic wheelchair athlete and Para Triathlete. Krige is a USA Paralympic competitor, and an ex South African Defence Force soldier who lost his legs in the Angolan war in 1987. His story is an amazing story of overcoming adversity, taking what the world throws at you and making the best out of what you have to work with. In his own words; “Its how you handle what happens to you that matters, not what what happens to you”. Krige grew up in the 70’s and early 80’s in the Strand, a sleepy little seaside town about 20 miles east of Cape Town. 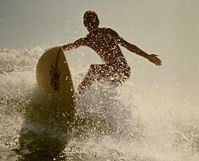 In those days it was it was an idyllic life of surfing, school and playing sports. But South Africa was fighting a war north of its borders in what was then South West Africa and in Angola; young men were conscripted into the army, trained and sent into action for two years followed by years of reserve force commitments. 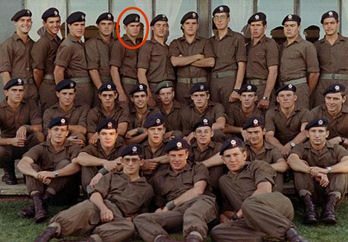 In the army, I was a corporal in the Engineer’s Corps, my injury occurred after I had completed my two years National Service, while I was doing a three-month call up as part of the reserve force, known as a “camp” to us in those days. My Captain asked me if I would like to go and help out 101 Battalion by doing a survey in Angola, I was keen. A team of four of us from the Engineer’s corps went on this trip. 2nd Lieutenant Bezuidenhout, myself, and two troops. Our task was to survey and record the details of an ex-Swapo base that 101 Battalion had taken over. This base was near the tiny village of Mupa in Angola, there was a mix of army guys there, a total of about 90, most were from 101 Battalion, (a predominantly Owambo battalion, i.e. local tribesmen). We stayed in a temporary base at an old convent near Mupa. But unfortunately the enemy found out we were there and sent 3 MiGs over to bomb us. Monday the 2nd of November 1987. Enemy MiG jets suddenly came flying directly over us, 2nd Lt. Bezuidenhout and Dave Seggie (a friend from 101Bn) saw a bomb coming down towards us, shouted and made for cover, I however did not see the bomb, and could not hear their warning shouts, so I took no evasive action and the bomb landed about 2m away from me on my right side. 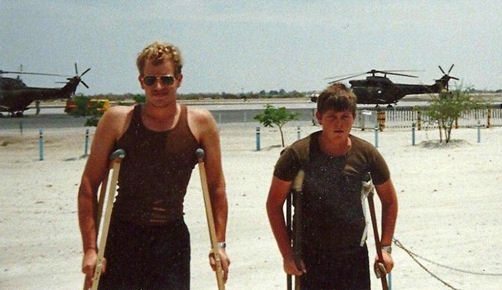 Dave, while running for cover, was caught by the blast, he later lost a leg, 2Lt. Bezuidenhout took shelter behind a wall and escaped unharmed. That I survived at all was a miracle, I lost both my legs above the knees and an index finger, I later had a partial gastrectomy (removal of damaged parts of the stomach) due to damage suffered from the blast. After the jets had past, the men came to pray over me, they read Psalm 23 while I was lying on the ground. I think they felt strongly that I was not going to make it. The 101 Bn. medic came and set up an intravenous drip for me but other than that and bandages there was not much else they could do. There was a big hole in my stomach and when I actually realised what had happened, I prayed for a second chance in life, like never before. Two guys on sentry duty jumped off a water tower when they saw the MiGs coming, they both broke their legs and ankles in the fall. The guys then had to decide who was going to carry my legs, the Lt. said he would, as my legs were a total mess, my one foot had been lying on my chest, still in a “flip flop” sandal. They loaded us into some 101 Battalion trucks to move us to a safe area for the casualty evacuation choppers to land. I remember that drive well; it was extremely unpleasant in my condition. It then took the choppers over 3 hours to come to get me and by then I was bleeding out. I was first taken to a field hospital and then on to 1 Military Hospital in Pretoria. After three days I fell into a coma, my stomach had exploded from the shock wave but they had not picked this up at the field hospital. I thus had an open and leaking stomach right until the night I arrived at 1 Mil. Hospital. The doctors told me afterwards it was a true miracle that I had survived. I was in hospital for a long time but luckily my wounds healed pretty quickly. I stayed in rehab until I could walk on prosthetics and this took some time and was not easy. Later when I went to University, I found the prosthetics to be too slow and cumbersome so I dumped them for a wheelchair, which is still the way I chose to get around. Looking back one thing still amuses me, the army sent guys to me in the hospital to look for my rifle, as if knew where it was? But the SADF was very good to me and did their best for me, 1 Military Hospital was excellent, I could not have asked for better treatment or rehab. What pulled me through it all? God’s help and intervention, the will to live and make the best of what I had at hand and a great supportive family. It is not what happens to you that matters it is how you handle what happens to you that matters. My motto is “Never give up”, but I must add that its been tested to the limit and its not easy at times. 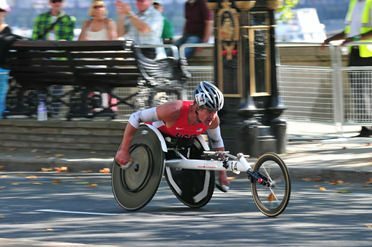 A big break for me was wheelchair racing, I have been able to make a living from it with up to twenty big races a year earning good prize money, its really gone well for me and we moved to the USA as there are more opportunities. We live in Cedartown Georgia where there is a dedicated wheelchair racing training establishment. We are very happy here, I have 2 boys, 13 and 11 and a girl of 5 and I am happily married to Caron who comes from my old hometown in South Africa. My real job is being a Dad. 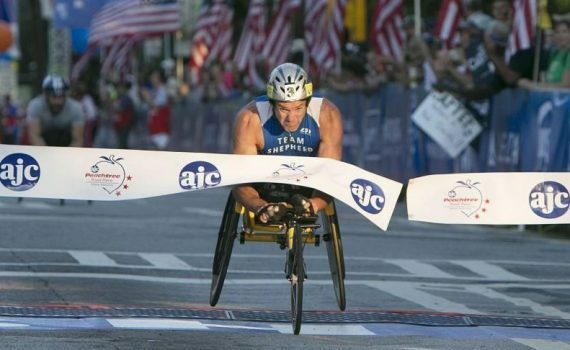 I have now competed in 5 Paralympics and done and won most of the big marathons around the world. I am now training for selection for the Rio Paralympics and I will retire from competition after Rio if I make it, my focus will then change to coaching others. It has not been an easy road. 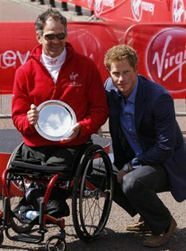 A few years ago, before the London Olympics I had another big setback, I was hit by a car in my wheelchair while out training, it was a hit and run. My head hit a tree and I could not move for some time, I feared that I was paralyzed and my young boys were with me, it was terrible. Luckily a youngster witnessed the crash and called 911 and reported it, they caught the bad guys the very same day. But I still suffer headaches and neck issues as a result; I have found ways to work around it. I also still have a bit of shrapnel in me that gets picked up in MRI’s and X-rays every now and then. And yes, I still surf! Wheelchair racing takes me to the Honolulu Marathon every year and there I rent a board and catch some waves with the kids what great fun! Krige Schabort, a champion and a true inspiration, a shining example of the victory of the human spirit over adversity. Krige, we at the South African Legion salute you!